Nicole Apollonia: through the help of the computer beside my sick bed. My name is Mrs. Nicole Apollonia, from Toulouse, France. for further details and instructions since I am in the end times of my life due to the ovarian cancer disease. Hoping to receive your response as soon as possible. Thanks for your kind respond,however, I choose to reach you throughHide quoted text, this source as it still remains the fastest medium of Communication. Once again, I am Mrs. Nicole Apollonia and i have been suffering from ovarian cancer disease and the doctor says that i have short time to live. I am from Paris, France, but based in Burkina Faso, WestAfrica, for over eight years ago as a business woman dealing on gold exportation. Regarding my previous mail to you, note that this is my dream do not play with it i have finally decided to hand it over to you for you to fulfill it. Try and get this money from ECO BANK PLC and use to help the poor, needy, orphans, victims of war and less privileged ones in the society in your country for my soul to rest after i have gone, i hope you are a God fearing some one, and do not inform or tell any one about it, let God be praise not man you will succeed if you keep it within yourself as a secret before the fund enters into your account take my words and let God be with you. 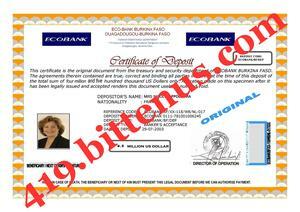 Attached to this email is a scan copy of the CERTIFICATEof DEPOSIT which i use in depositing the fund with the bank in the year 2003, i want you send it to the bank so that the bank may not have doubt transferring the money to you as I have instructed them that any body who can provide my passport and the certificate to them will be the rightful beneficiary to the fund. I pray to God to give you the straight to proceed, please do not be discourage no matter what I will always be with you in spirit before you accomplish my dreams, note that you are my hope of making the chance to be with God. contact him he will assist you he will be happy to hear from you because I just talk to him now regarding your matter. Below is the bank contact information, contact the bank by putting claim as the beneficiary to my fund/money with them. THIS IS TO ACKNOWLEDGE THE RECEIPT OF THE INSTRUCTION LETTER THAT WAS SEND TO OUR BANK PUTTING CLAIM OVER THE FUND OF MRS. NICOLE APOLLONIA, mrsnicoleapollonia11@yandex.com , ATTACHED BELOW OUR BANK FORM YOU ARE ADVISED TO FILL IN THE BANK FORM CORRECTLY WHERE THE FUND WILL BE TRANSFERED. . This is to acknowledge the receipt of the mail forwarded to me from your partner,Mrs. Nicole Apollonia, mrsnicoleapollonia@yandex.com , mrsnicoleapollonia11@yandex.com , on your behalf and the content are wellnoted. Actually this woman has been suffering fromovarian cancer disease and the doctor says that she has just few days tolive, the information i got is that her doctor prescribed her to go angioplasty surgery. the fund to sponsor terrorism or involve yourself in drug or any formof violence in your country or any part of the world. Thanks for your kind respond, however, I choose to reach you throughthis source as it still remains the fastest medium of communication. Once again, I am Mrs. Nicole Apollonia and i have been suffering from ovarian cancer disease and the doctor says that i have short time to live.I am from Paris,France, but based in Burkina Faso,Africa, for over eight years ago as a business woman dealing on gold exportation., regarding my previous mail to you, note that this is my dream do not play with it i have finally decided to hand it over to you for you to fulfill it. Try and get this money from ECO BANK PLC and use to help the poor, needy, orphans, victims of war and less privileged ones in the society in your country for my soul to rest after i have gone, i hope you are a God fearing some one, and do not inform or tell any one about it, let God be praise not man you will succeed if you keep it within your self as a secret before the fund enters into your account take my words and let God be with you. 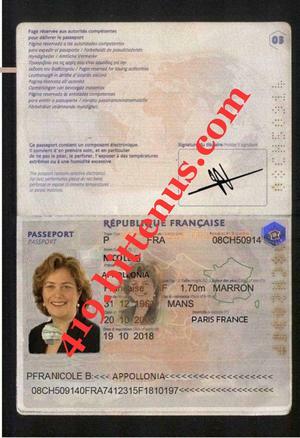 Finally, i send my PASSPORT and the CERTIFICATE of DEPOSIT to the bank and let them know the following procedure, regarding all I have instructed you to do with my money with them; I may not live to read your email again because my condition is getting worst. Note that one of the bank director is my very good friend and I have told to help you in any area you need his assistant, his name is Mr. Michel kafando, here is hisphone and email. .
contact him, he will assist you, he will be happy to hear from you because I just talk to him now regarding your matter. 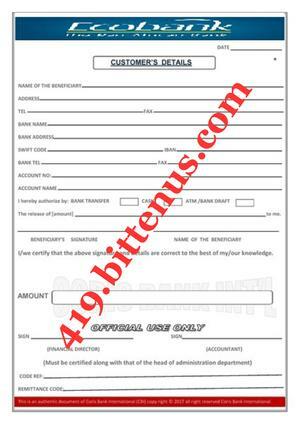 Below is the bank contact information, contact the bank by putting claim as the beneficiary to my fund/money with them.